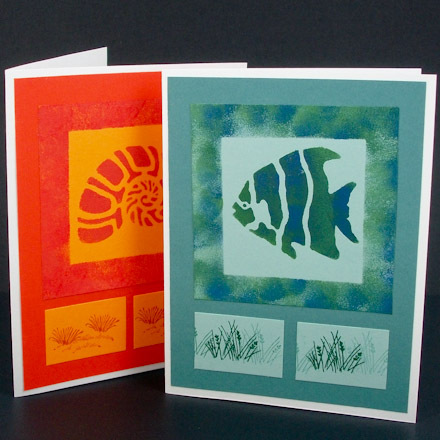 In this tutorial, you'll learn how to make cards using stencils and acrylic paint. 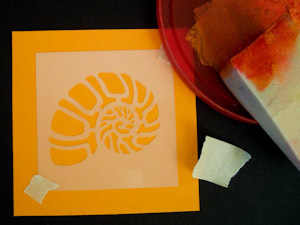 You'll also be shown how to make your own stencils using paper punches or a few snips with scissors. 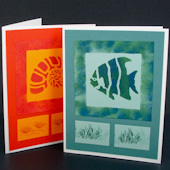 Learn to stencil cards and you'll be able to use the same skills to stencil scrapbook pages, note paper, envelopes and more. The creative options with stenciling are infinite when you mix paints to make unique colors and cut your own stencils. Related crafts: Have more stencil fun in the Stenciled T-Shirts, Stenciled Flower Pots, Snowflake Window Stencils and Festive Window Stencils craft projects. 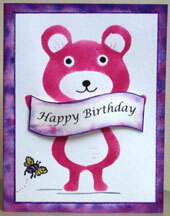 This tutorial is the fourth of twelve card making tutorials and is rated EASY to do. To avoid blurs, use masking tape, drafting tape or repositionable adhesive spray to hold the stencil in place. Masking tape can rip a card when removed. To avoid this, put the masking tape on your clothing first. This picks up some lint and reduces the stickiness of the tape. To avoid smudges, cover any parts of the stencil not being used with masking tape. 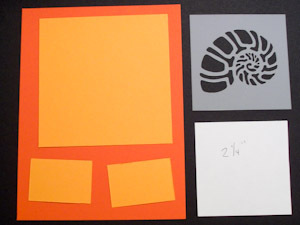 Also cover exposed areas of the card with pieces of scrap paper or cardstock. Slightly dampen the sponge before loading it with paint. To avoid bleeding around the edges of the stencil, use as little paint as possible. To do this, only use a few drops of paint and dab the sponge up and down several times in the small puddle. Next, test the paint on a scrap of paper by dabbing up and down a few times. The paint should be almost transparent on the first dab and grow darker as you dab more. If the paint doesn’t dry almost immediately, either the sponge is too wet or you are using too much paint. Dab straight up and down—no swirling, no pulling across like a brush—just straight up and down. This will prevent paint bleeding under the edge of the stencil. 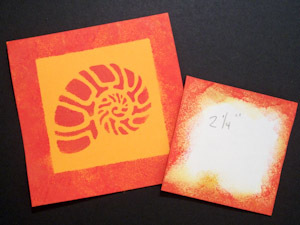 To make a simple stenciled card, like those pictured in this project, first try stenciling on some scrap paper, then proceed to the next steps. Select two coordinating colors of cardstock. 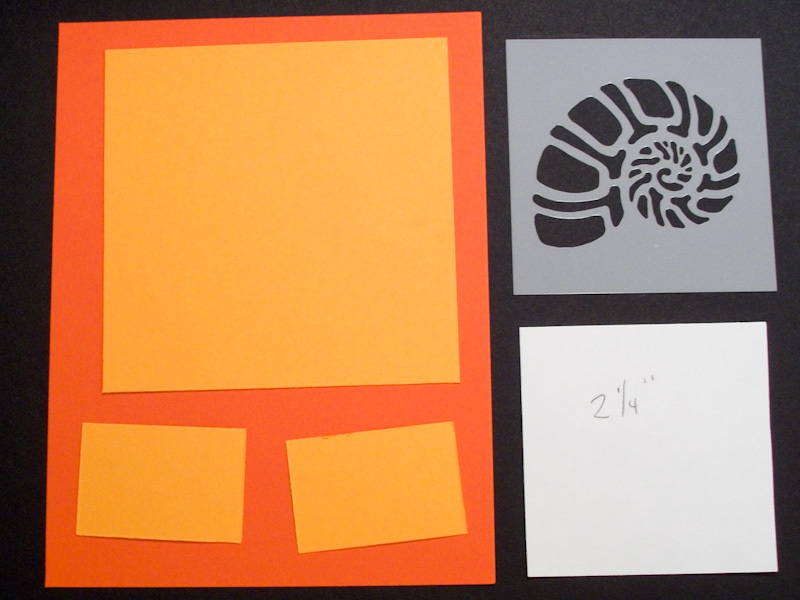 Cut a 4" by 5¼" mat from one color of cardstock. 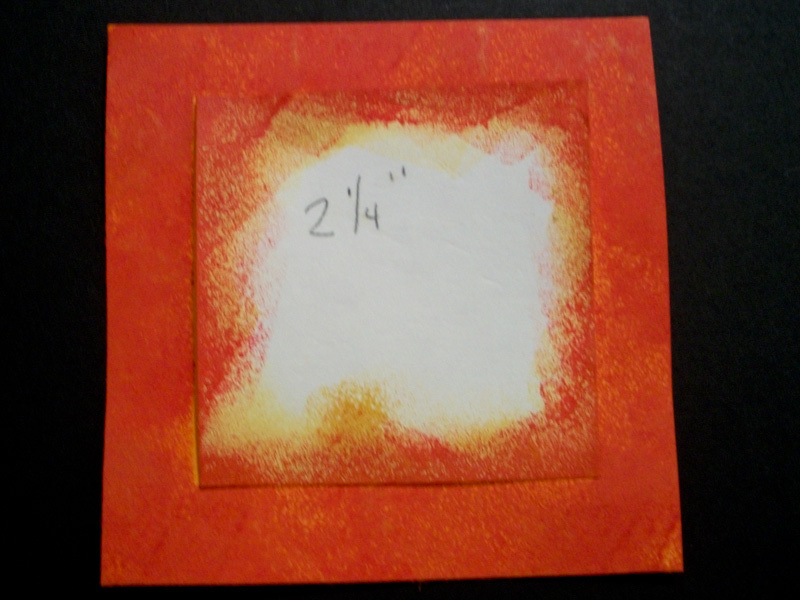 Cut a 3¼" square and two 1½" by 1" rectangles from the other color of cardstock. 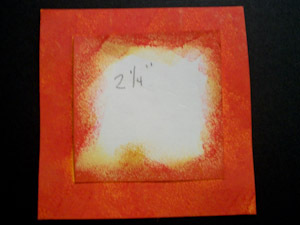 Cut a 2¼" square from a scrap of cardstock. Select one or two colors of acrylic paint that coordinate with the cardstock. Be sure that the paints are well mixed. Center the stencil image on the 3¼" square and secure with masking tape, drafting tape or repositionable spray adhesive. Put a few drops of paint on the plastic lid and load a dampened sponge with paint. Dab up and down on the stencil until you achieve the desired darkness and shading. Carefully remove the tape, then remove the stencil by lifting straight up. After the paint is dry, center the 2¼" square of scrap cardstock over the stenciled image. Secure it with a masking tape roll on the back of the square. Create a border by dabbing the sponge along the edges. Remove the 2¼" square to reveal the border. Stamp images on the two small rectangles. 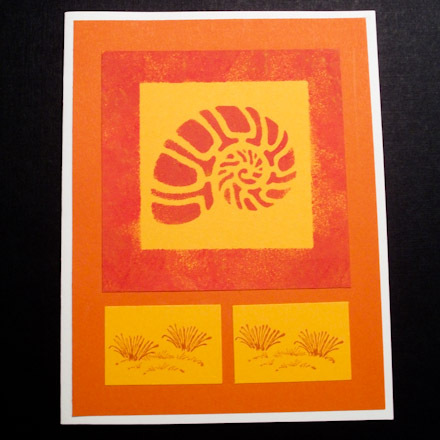 Assemble the card by gluing the stenciled image and stamped rectangles to the larger mat, then gluing the mat to the card. Your stenciled card is done! 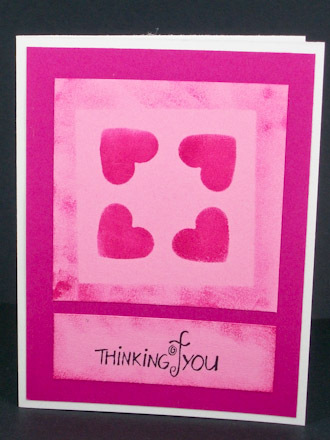 Tip: Stencils made of cardstock can only be used to make a handful of cards. For a longer lasting stencil, use special stencil paper or stencil plastic. 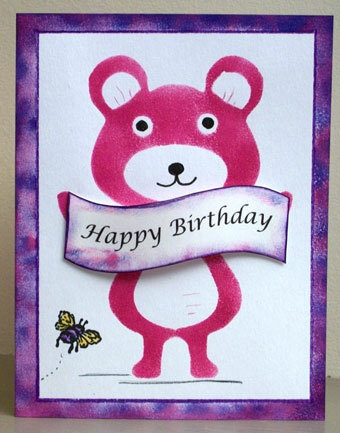 Tip: Use the printable Bear Birthday Card Stencil pattern to make a stenciled card featuring a teddy bear holding a banner. 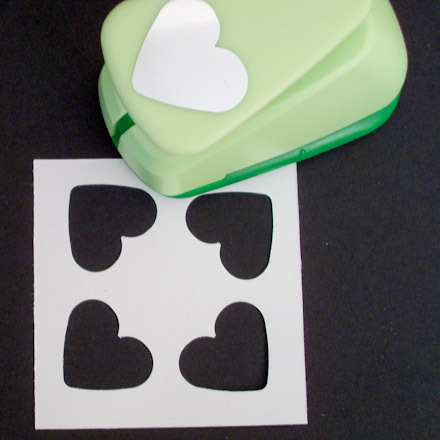 Print the pattern and cut out one of the stencils. It is best to adhere the stencil pieces inside the bear's body with temporary or repositionable glue. See detailed instructions in the Stenciled Bear Christmas Cards craft project.